Learn about conservation efforts at the Fausto Llerena Breeding Center. Embark Silver Galapagos and depart on your exciting Silversea Expedition — North Central Galápagos. After settling in, attending a mandatory safety drill and setting sail, you will be introduced to your Expedition Team. Silver Galapagos will then head for Daphne to do a circumnavigation – usually only scientist are allowed to land. From the ship we will watch for Nazca and Blue-footed Boobies, frigatebirds, Red-billed Tropicbirds, Brown Noddies and Brown Pelicans, as well as Swallow-tailed Gulls. In the evening enjoy the first of many memorable meals in The Restaurant. At Genovesa Island the ship tucks into Darwin Bay, an ancient volcanic crater now flooded by the sea. Zodiacs land on a picturesque sandy beach where Galapagos sea lions often rest on the fine, white sand. Explorations along the shore may reveal marine iguanas looking like prehistoric dinosaurs in miniature. By heading inland a short distance visitors could encounter seabirds of all shapes and sizes nesting in the vegetation. Scores of immature Red-footed Boobies perch on branches within an arm’s reach of the path. In addition, watch for Great Frigatebirds and Yellow-crowned Night Herons along the walk. The landing at North Seymour Island is onto black lava rock. After a short climb, visitors arrive on the island’s flat plateau where a number of sea lions nurse pups and frigatebirds nest. The island is dry, and so the predominant tree is the prickly pear cactus favored by the yellow Conolophus land iguanas that live here in number. The undulating terrain is littered with red-brown volcanic boulders and large male Magnificent Frigatebirds can be seen inflating their vivid red gular sacs in hopes of impressing females flying overhead. At certain times of the year, pairs of Blue-footed Boobies dance here in a ritualized mating dance that reinforces their pair bond and shows off their vivid blue feet. 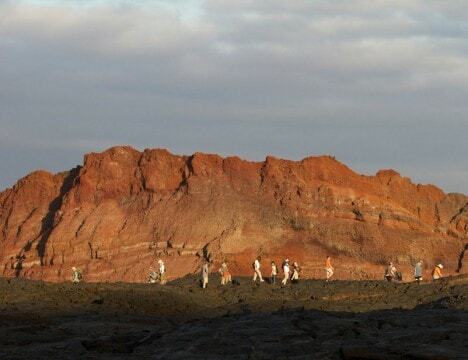 The lava fields of Sullivan Bay on Santiago Island will inevitably remind visitors of the surface of the moon. As brilliant red Sally Lightfoot crabs scuttle along the black volcanic shores, learn about the formation of the islands through geological forces from your guides. The lava flows here are just over one hundred years old and date back to 1897. The lava took on a rope-like appearance and geologists have adopted a Hawaiian word, pahoehoe, as the technical name for this kind of volcanic rock. After walking the exposed rocky terrain, it is a welcoming sensation to return to the sandy beach and get ready for a swim or a snorkel. .
Rabida is a small picturesque island with red rock cliffs and maroon sand. Here we can see Darwin’s finches, lava lizards and Galápagos Mockingbirds. Take a walk along the cliffs where the red rocks, green Palo Santo trees and the blue turquoise sea create landscapes of stunning contrast, while an underwater world teeming with colourful tropical species and vibrant submarine landscapes is equally amazing. After a short but rewarding hike, we will have the opportunity to swim or simply stroll along the beach and admire the sea lions snoozing along the shore. You can also go for a stunning snorkel-excursion with sea lions, reef sharks, marine iguanas, colourful anemones and parrotfish, or kayak along the picturesque Rabida cliffs. Sail to Eden Islet for snorkelling, kayaking and Zodiac rides. Eden is a small, eroded tuff cone and an excellent example of the unique geology of the Galápagos. It is home to Great Blue Herons, sea lions, and Blue-footed Boobies; while the small tidal areas can be a resting place for reef sharks, eagle rays and green turtles, they make an excellent spot for kayaking as well. The most emblematic animal in the archipelago is the Galápagos giant tortoise. Over-hunting and competition with introduced animals has left its numbers close to extinction. Nonetheless, since the late 1950s, the tenacious work of the Galápagos National Park Service park rangers and the scientists of the Charles Darwin Research Station has been bringing those numbers back. We’ll see these ancient reptiles and their babies, and learn more about current conservation efforts at Galapaguera Cerro Colorado. 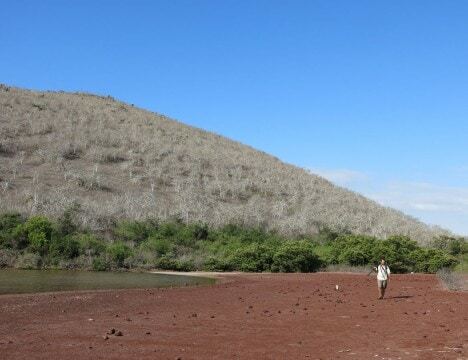 Breeding and rearing endemic animals in captivity is part of a much broader conservation programme aimed at restoring and protecting the Galapagos Islands’ natural biodiversity. and Nazca, as well as both the Great and Magnificent Frigatebird. After a wet landing on an olivine beach where sea lions doze, we’ll climb up a ravine to view one of the most scenic panoramas in the archipelago. San Cristóbal or Chatham lava lizards guide our way, while Red-footed Boobies and Nazca Boobies fly overhead. Don’t miss a chance to swim with sea lions from the gorgeous beach at Gardner Bay. Relax on the white sands of this idyllic beach as the water laps gently in front of you. You may even spy some iguanas on the shore. Further out you can snorkel with large schools of colourful tropical fish and an occasional manta ray, while a whitetip reef shark naps on the bottom. You may wish to experience this from a kayak: paddling through crystal-clear waters while marvelling at the natural wonders all around you. its home. Mockingbirds, doves, and occasional Galápagos Hawks can also be found, as well as sea lions and colourful marine iguanas. We will cruise overnight to Santa Cruz, an island in the central part of the archipelago with the largest human population. The headquarters of the Galápagos National Park Service and the Charles Darwin Research Station are located in the small town of Puerto Ayora. The Station is the operative branch of the Charles Darwin Foundation, an organisation established in 1959 to provide conservation counsel to the Ecuadorian government. 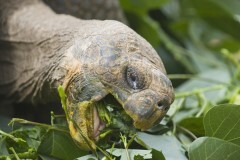 Its flagship program is the restoration of Galápagos giant tortoises. South Plaza is a neat little island located close to the eastern coast of Santa Cruz. Its main attraction is a colony of Galápagos land iguanas, but the setting is also a highlight — giant prickly pear cactus, the reddish sesuvium plant, a mat-like ground cover, and a large nesting colony of Swallow-tailed Gulls make this small island an excellent stop. Marine iguanas and Galápagos sea lions are also around.